Back problems in the horse by Peter Gray. At the outset, it has to be clear we are considering problems that can be resolved. They are expressed by stiffness in movement, signs of pain when ridden, a lack of symmetry as the horse goes forward. These signs often go with a developing reluctance to be ridden. Horses may bolt, buck, rear or object in some other way. Where there is any indication of spinal damage, the answer will not be found here. Horses confirmed as ‘wobblers’ or ‘shiverers’ generally have irreversible spinal lesions. Any other indication of coordination failure will need clinical evaluation by your vet. 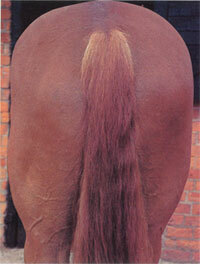 A horse with back problems is primarily restricted by pain. This may only, or mostly, be apparent when ridden, though movement and tracking are generally evaluated on a lunge rein. The pain may come from the bony spine or from the muscular system. The difficulty of seeing change is evident from our film ‘The Horse – in Motion’; the reason it was produced was to help those who wish to learn to recognise obscure lameness, though it may not be immediately evident and the film may have to be watched repeatedly before its message becomes clear. Asymmetry, at rest and in motion, is often an expression of upper body problems. It is generally not coincidental, or natural anatomically, but an expression of change that affects stride length and direction; and leads to discomfort in movement. The horse should be examined closely at rest from all angles, then watched walking away and back, then trotting. Abnormality will be most easily seen at the walk and the way this follows through at the trot will tell its immediate significance. If the horse moves better at the trot, there is always a chance it may manage to cope with the problem – though it may not. If it moves more abnormally, it’s unlikely that it will. Such problems may arise at any time in a horse’s life. While they are less common in younger animals, a fall when being broken might bring injuries the influences of which only become noticed in time. Horses that slip up, fall, have to correct violently, commonly suffer muscular injury in the process. This may lead to direct, or indirect, influence on the bony spine. The degree will decide future significance and the influence may be immediate or gradual. Horses suffering from spinal pain need manipulation by a qualified chiropractor. A list of chiropractors is available from www.gcc-uk.org . It is important to use individuals with appropriate training and qualifications; unqualified practice is potentially harmful to horses. 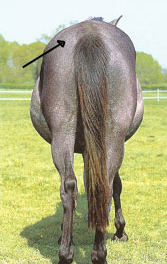 The chesnut horse below shows almost perfect symmetry to both sides of the pelvic spine while there is obvious wasting of muscles on the left side of the grey mare. Such wasting is always clinically significant in the athletic horse because it means an alteration of stride and imbalance in movement which may gradually affect the musculature of other limbs and expose lower limb structures to possible secondary injuries through the way they make contact with the ground.